Butterflies in High Park, Toronto. Photo by Lila Cheekytree. On Sunday morning I went for a walk in High Park. Along a winding dirt path, I stopped to photograph a simple yellow flower when a butterfly flew into frame. It was only then that I looked up, way up, and noticed dozens of orange and black butterflies fluttering high above me. They were beautiful. For me, the image I captured on that sunny morning evokes feelings of lightness and joy; just two of the many uplifting things the butterfly symbolizes in cultures around the world. I hope this week you’ll go outside and see for yourself all the beauty in Nature that surrounds us. Soon! Before the weather gets cold. This entry was posted in happiness, Life, Nature and tagged butterflies, High Park, hope, joy, photography, symbolism by Lila Cheekytree. Bookmark the permalink. Thanks Jai. I was not familiar with the song Sleepwalk, so just listened to it now and I love it! I wish that soundtrack was playing when it actually happened. How cool would that be? Here’s a link to a video of Santo & Johnny performing Sleepwalk from 1959. There will be snow in Edmonton before you know it. Yikes! I’m so glad you caught this part of the Monarch migration completely by surprise! Sunday the sky was speckled with butterflies everywhere over Lake Ontario. It’s a very magical time of year. Thanks for sharing! Thanks for sharing this Kimmy. I had no idea that Monarch Butterflies even migrated..guess I never stopped to think about it. I just looked it up and apparently each fall and spring the butterflies travel to and from Mexico. I’d like to winter in Mexico too. That butterfly, she’s beautiful and smart and winters in exotic locations. You have so inspired me with your blog that I’m going to go search for something beautiful after work today, and write about it on my blog! 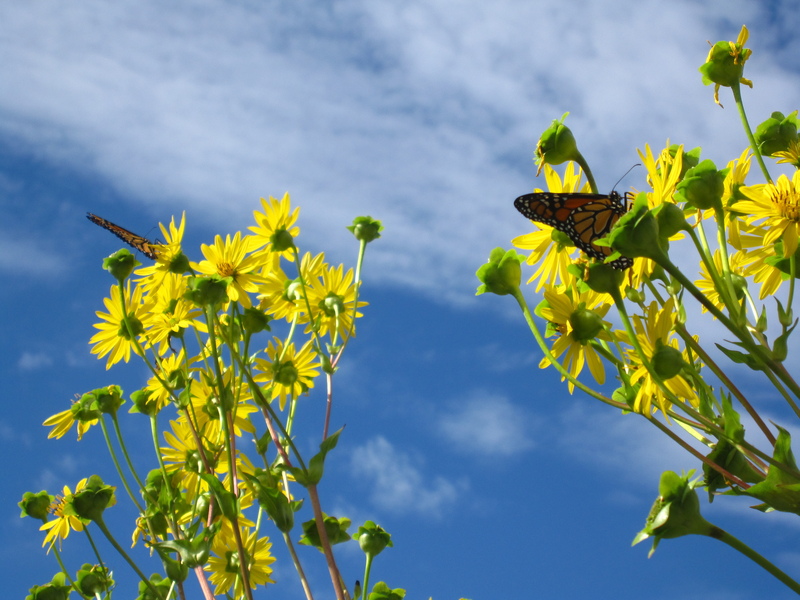 What a lovely moment that you captured – monarch butterflies always bring a smile to my face. If you haven’t visited the Butterfly Conservatory in Niagara Falls I would highly recommend it; it’s a whole lot of happiness – especially when a butterfly lands on you! I love the Butterfly Conservatory in Niagara Falls. I totally agree with you, it’s a whole lot of happiness. That’s a calendar-worthy photo Lila! It makes me think of my childhood chasing butterflies with my grandfather’s fishing net (don’t think I ever cought one). To me, that memeory is pure innocent happiness.